Basics about off-grid solar PV systems: An off-grid system is not connected to the electricity grid and therefore requires battery storage. An off-grid solar system must be designed appropriately so that it will generate enough power throughout the year and have enough battery capacity to meet the home’s requirements, even in the depths of winter when there is less sunlight. The higher of batteries and inverters means off-grid systems are much more expensive than on-grid systems and so are usually only needed in more remote areas that are far from any electricity grid. However battery costs are reducing rapidly, so there is now a growing market for off-grid solar battery systems even in cities and towns. There are different types of off-grid systems which we will go into more detail later, but for now I will keep it simple. This description is for an AC coupled system, in a DC coupled system power is first sent to the battery bank, then sent to your appliances. The solar battery bank. In an off-grid system there is no public electricity grid. Once solar power is used by the appliances in your property, any excess power will be sent to your solar battery bank. Once the battery bank is full it will stop receiving power from the solar system. When your solar system is not working (night time or cloudy days), your appliances will draw power from the batteries. 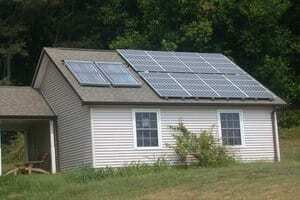 The general rule for an Off-grid Solar system: the simpler the system, the better. A high-quality PV charge controller is the most important component within the PV off-grid systems. Controls the flow of current to and from the battery, to protect it from over charging after reaching the required voltage within the battery (eg protect against boiling the electrolyte). The over-discharge protection occurs, when the loads will cause critical/min voltage within the battery. The deep discharge protection is an optional feature (but very common), helps to protect the batteries against damage (fully discharged battery may cause its damage). Do not exceed the allowed voltage and current of charge controller. Voltage refers to PV panels Voc and current, its Isc. Calculate panel Voc x1.2, the Isc x1.25 – for safe buffer under extreme weather conditions (more than STC: 1000W/25C/1.5AM). Example: if in the PV solar panel datasheet defined voltage 30Voc, calculate it as x1.2. Thus possible (~max) occurring 36V. This same in case of panel’s Isc, if defined as (eg) 8A calculate as x1.25 and possible occurring may be 10A. If an PV string will be created and in series connected (several modules in section) the voltage and current adds up (!). This is especially important while selecting the PV charge controllers (its max allowed parameters). In this case for an PV module with 30V/8A, the needed charge controller should withstand 36V and 10A. Always buy a good one, failure of one PV module can mean failure of whole system. The solar batteries are the weakest point within the solar PV off-grid systems. Important characteristic is the allowable discharge level (%) of its full charge of capacity (Ah) and the number charging cycles. Connect loads to the charge controller. See more diagrams for PV off-grid systems. The most important component in PV off-grid systems is the charge controller. It is the brain of the system, responsible for: performance, durability and functions. Charge controller, also known as solar regulator, coordinate the main components of any off-grid systems: PV generator, batteries and loads. The common voltages in off-grid systems are 12/24V and 48V, which means the voltage of system batteries. The most common failure in charge controllers are: burnouts. The two main types of charge controller are: PWM and MPPT. The difference result from the charging mode. PWM charge controller uses the Pulse-Width-Modulation and an MPPT controller the Maximum Power Point Tracking and enables up to 30% more energy yields, than the PWM controller. PWM (Pulse Wide Modulation) charge controller reduces the voltage from the PV module to that of the battery, resulting in a decrease in efficiency. PWM charge controller, works based on 1/2/3 or 4-stage charging method, switching between constant stages according to the occurring PV voltage and current. The efficiency loss depends on the difference size of the voltage, between PV modules and batteries. PWM charge controllers are less expensive (than MPPT) and are an ideal solution for smaller PV systems where the price can be a critical point, or where the maximum efficiency (as in MPPT 98%) and additional power is not really needed. Sizing an PV system with an PWM charge controller, it is important to consider the open circuit voltage (Voc) of the module. Every charge controller has a maximum input voltage. The PV generator should have a temperature compensated Voc less, than the max. input voltage of the controller. During PWM switching cycles, the controller is exposed to the open circuit voltage (Voc). Using higher Voc, than the controller max. allowed input voltage (Voc), will damage the charge controller. and results from: min battery voltage + 30V. Above 41/52V it will be critically. This rule applies to Phocos PWM charge controllers in 12/24V systems, but also to the most common charge controllers based on PWM charging method. To reach the optimal efficiency of an PWM charger controller, the upper limit of the PV rated power is at around 130-150Wp. However the PV rated power (at STC) will be reached only several times in a year, at extremely hot summer days, and more probably at very sunny cold winter days. Sometimes users choose consciously bigger PV modules (rated power) for higher energy yields at weak solar irradiance. The PV systems works approx 60-70% of its annual average working time at 60% of rated power (in Central Europe). In this case the system will work proper, also with PV modules at higher rated power (~200Wp), but the critical point is, not to exceed the allowed Voc and Isc of the connected charge controller. This can happen in winter at lower temperature under intensive sunshine, or in PV systems installed 1.500m above see level (if yes, then requires derating of nominal parameters of applied PV inverter or charge controller). That’s why it is important to calculate the PV module or string Voc and Isc at 120% (x1.2) where additional 20% are buffer and corresponds to extreme weather conditions in low temperature ranges. At hot summer days this problem may also occur, but decreases due the temperature coefficient. Higher module temperature decreases its rated power at around 0.4-0.5% for every 1C over 25C. In praxis in hot summer day and 60C surface temp. of an 100Wp module, he will work at around 83Wp and the 17W are losses due to the temperature coefficient. As result the Voc and Isc of the PV module in hot summer days will be less. Systems with slightly oversized PV modules (~190-200Wp) and an PWM charge controller, will be not able to use the max. PV rated power at full sunshine, but they will operate optimally under cloudy weather conditions, typical for central European locations. The another reason for such solution is the possibility of use an high quality 190Wp PV module which probably will be at similar price, as an 130Wp PV module, which are less common. An very safe rule says: calculate 30% safety buffer (especially in off-grid systems). Then if an 20A charge controller, withstands up to 52Voc (in an 24V battery system), the parameters of desired PV panels should be calculated ca -30%, about 14A/36Voc, with respect to the system safety. Another part is system efficiency, if highest efficiency is required, choose the MPPT charge controller. They are two fundamental advantages (comparing to PWM controllers): system efficiency and applicable for big PV panels. The MPPT charge controllers allow PV modules to operate at their higher optimum voltage in varying light conditions: summer, winter, morning, noon, cloudy etc. The MPPT charge controller takes the voltage output of the solar panels and compares it to the battery voltage. It figures out what is the best voltage to get maximum current (A) into the battery. Or said in another way, the MPPT controller tracks the best voltage level and then down converts it to the voltage of batteries. MPPT (Maximum Power Point Tracking) charge controller calculates in real-time the optimal charging parameters, continuously by its internal algorithm. MPPT tracking of the optimal power point, improves performance by as much as 30% (annual energy production), compared with the PWN charge controller. PWM (Pulse Wide Modulation) charge controller, works based on 1/2/3 or 4-stage charging method, switching between constant stages according to the occurring PV voltage and current. For Phocos MPPT 100/30 charge controller the max. (connectable) PV voltage is 95Voc, and enables connecting up to 450Wp PV rated power in 12V systems, and up to 900Wp in 24V systems. For Phocos CIS-MPPT 75/20 waterproof charge controller the max. (connectable) PV voltage is 75Voc, and enables connecting up to 250Wp PV rated power in 12V systems, and up to 500Wp in 24V systems. MCS for external generators like wind- or hydro turbines. The PV module or string Voc and Isc multiplied by x1.2 and x1.25 can not be higher then the max allowed current (A) and voltage (V) of the charge controller. The upper limit of the maximum Voc and current (A) should be defined in the datasheet of the controller. For MPPT 100/30 according to 95V and 30A, and for the CIS-MPPT 75/20 according to 75V and 20A. If in the datasheet only the max voltage and current defined, then in the most cases it means Voc and Isc, of the PV generator. The maximum allowed voltage (at the PV charge controller) can be controlled by appropriate connection type of the PV modules (in series or parallel). Voc (open circuit voltage) and Isc (short circuit current) – of any PV module or string can not exceed, the allowed input voltage and current of charge controller or PV-inverter. The thereby resulting possible damages on charge controller or inverter are not covered by the warranty. Voltage (Voc and Vmp) can be managed by appropriate wiring of the modules, within string. When modules connected in series, the PV voltage (V) will be added up. If modules are connected parallel, the voltage (V) stay at the level of one module, but the current (A) adds up. Isc – is maximum amperage generated by a PV panel exposed to sunlight. The PV circuit’s wire size and overcurrent protection (fuses and circuit breakers) calculations are based on panel Isc (A) and should be rated as minimum 125% of the rated power of the charge controller. For an 30A controller, the max. allowed PV current (Isc) will be 24A (23A x 1.25 = 30A). Vmp – is the voltage, where a panel outputs the maximum power. Vmp should be higher than (but optimally close to) the maximum battery voltage. PV technologies – have different voltage characteristics. For example thin-film modules operate at much higher voltage, which can be an challenge for off-grid systems (concerns modules <100Wp). That is why, we recommend to use high-quality PV modules, if the mounting surface (area) allows, take proven and stable PV on-grid modules, optimally with MPPT charge controller for highest efficiency and long term trouble free operation. There are two basic types of batteries that are available for use in a standard solar energy production system: sealed batteries (AGM or Gel cell) and flooded lead acid (FLA) batteries. Sealed batteries require only little maintenance in order to keep them working properly, the FLA batteries have a longer lifespan. A cycle in a solar battery occurs when it is discharged and then recharged back to its full level. How much a solar battery is discharged, is called the depth of discharge. Deep cycle solar batteries are designed to be repeatedly discharged and recharged in cycles, where up to 80% of the battery capacity is used up. Deep cycle solar batteries are dedicated for solar PV systems and in systems above approx 200Ah capacity, the only right choice. A shallow-cycle-battery is when the 20% or less of the battery capacity is discharged and recharged. Shallow cycle batteries are designed to give up lots of power over a short period of time. They are used in cars and vehicles and are less suited for PV off-grid systems. Similar like in PV modules, proper connecting wiring of batteries influence the system voltage. In series connected two batteries with 12V, will be an battery-bank with 24V voltage. In large scale projects usually are used 2V or 6V batteries, connected in series to build up an 24V or 48V system. Then (mostly) converting to an 230V-AC current. The less voltage differences 48V-DC/230V-AC, the higher the system efficiency, in an 12V/230V system, the losses will be the highest. Batteries connected together to a battery-bank, should have the be the same batteries types and capacity. An important influence on the battery is its ambient temperature, ideally at about 10-20C. Their ventilation and storage. In extreme cases, low quality batteries can catch fire, that is why an appropriate ventilated and fireproof boxes are important. A fuse between battery and charge controller (inverter) may be very useful, and is necessary in middle and large off-grid PV systems. The fuse parameters are related to the charging current and load current within the system and battery. In large scale PV off-grid projects the batteries connected in series, will “learn each other” at the first years of usage and the whole system operates at the first months or even years under such learning process, controlled by an PV off-grid inverter (converting DC>AC) and charge controllers on the DC>DC site. For your PV off-grid system you will need deep cycle batteries. These are designed with thicker plates for constant deep discharging and recharging. This is different than a car battery which is designed to provide a high burst of power for a short time. visual check of system components (significant discolorations, cables, connectors, charge controller port). 1.1 Calculate total Watt-hours (Wh) per day for each appliance used. Add the Watt-hours needed for all appliances together to get the total Watt-hours per day which must be delivered to the appliances. 1.2 Calculate total Watt-hours (Wh) per day needed from the PV modules. Multiply the total appliances Watt-hours (Wh) per day x1.3 (the energy lost in the system) to get the total Watt-hours per day which must be provided by the panels. Different size of PV modules will produce different amount of power. To find out the sizing of PV module, the total watt peak (Wp) produced needs. The peak watt (Wp) produced depends on size of the PV module and system location. We have to consider “sunlight factor” which is different in each site location. For central europe the factor is around 3, and corresponds to about 3 hours of sunlight, per day, expected average over the whole year (including in the winter time). Divide the total Watt-hours per day needed from the PV modules (from item 1.2) by 3 to get the total Watt-peak rating needed for the PV panels needed to operate the appliances. The factor 3 corresponds to the day-hours sun radiation under central european conditions and all season working mode (also winter), if PV system working in spring-summer-autumn the factor will be around 4-5 and for systems working only in summer, around 6-7 hours sun per day (factor=6 to7). Divide the answer obtained in item 2.1 by the rated output Watt-peak of the PV modules available to you. Increase any fractional part of result to the next highest full number and that will be the number of PV modules required. An inverter is used in the system where 230V-AC power output is needed. The input rating of the inverter should never be lower than the total watt of appliances. The inverter must have the same nominal voltage as your battery (12/24/48V). For stand-alone systems, the inverter must be large enough to handle the total amount of watts you will be using at one time. The inverter size should be 25-30% bigger than total watts (W) of appliances. In case of appliance type is motor or compressor then inverter size should be minimum 3 times the capacity of those appliances and must be added to the inverter capacity to handle surge current during starting (first 3-6 seconds). Example: if total watts (W) of working appliances is 150W, your PV inverter converting the electricity from batteries in 12/24/48V-DC into 230V/50Hz-AC, should be around 200W (150W + 30%). 4.3 Divide the answer obtained in item 4.2 by 0.5 for depth of discharge. As mentioned above, the solar charge controller is typically rated against Amperage (A) and Voltage (V) capacities. Select the solar charge controller to match the voltage of PV system and batteries and then identify which type of solar charge controller is right for your application. Make sure that solar charge controller has enough capacity to handle the current from PV system. For the PWM charge controller type, the sizing of controller depends on the total PV input current which is delivered to the controller and also depends on PV panel configuration (series or parallel configuration). The system will be powered by 190Wp PV modules. Fundamental question: should the PV off-grid system operate over the whole year (summer and winter) or seasonally ? If seasonally then the amount of solar sun hours should be related to the desired season (in Central Europe in winter about 2-3h up to 6-8h in the summer). For all-year PV off-grid systems, the average daily solar exposure expressed in hours, should be related to the lowest solar radiation in winter (eg. 2-3 hours). And the daily solar sun exposure (h) will be different for Estonia, Slowenia or Spain, additionally the solar exposure for mountain hut at 2000 above see level will be much higher than in the city. So this system should be powered by at least 2 modules of 190Wp PV module. The inverter size should be about (153 x 1.3) 200W or greater. The main point here is the allowed discharge level of battery (here 50%) if more, the needed capacity (Ah) significant less. The solar charge controller should be rated at 20A or greater and would be a little undersized, but OK. The PV voltage (Voc) of 2x190Wp panels, connected parallel (!) will be 31.15, multiplied x1.2 = 37Voc. The max allowed voltage within an 12V PWM charge controller is 41Voc, and will be not exceeded (37V), thus is OK. According example above (2x190Wp) an 20A PWM charge controller for 12V system should be chosen. And will work optimally at slightly cloudy weather, typical for Central European location.